Ich schreibe dismal auf English weil ich gerade das gleiche Post auf Hiarcs auch gestellt habe. Der Marco M.Z. 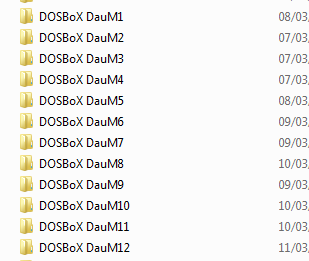 hat mir gezeigt wie man auch komplette Cd's hochladet und zum laufen bringt daher hat sich die Liste um einiges noch vergroessert was unter DOSBox Windows 95 lauft. A few more programs I got working yesterday, with the help of Marco (M.Z.) who showed me how to figure out loading complete disk images and using a virtual drive. This is a Windows 3.11 program which until now I could only play through DOSBox Windows 3.11 by keeping the original CD in the drive. But I could also get it to work the same way under DOSBox Windows 95. The program is based around the DOS program Chess Genius 1 which was converted for Windows 3.11 and sold by Hexaglot. Shredder 4 works well too! And Shredder 5.32 gui works as well. Deep Junior 6 gui also has Junior 5 included. I showed previously Chessmaster 4000 and 5000. Well Chessmaster 5500 and 6000 work as well! Chess Master 8000 works just fine as well, so Chess Master 7000 should also work. I have run out of Windows 95 virtual hard disk space so for now I am going to leave at that. With DosBox you can create a master hard drive and a secondary hard drive. These last few programs are much bigger in size so they filled up the secondary hard drive. But what you can do if you want even more programs to work, you create a third and fourth hard drive and attach them as the secondary hard drive and so you can play more and more if you want. I am satisfied with what I have for now. Maybe someday I will build another hard drive and attach some missing stuff such as Shredder 1-3 and 5 and Power Chess but beyond that there is not much more that I would want. Perhaps a secondary hard drive where I put all the DOS Programs into it. I simply use multiple folders..
For each 1 GB configuration for the operating system and a 2 GB HDD slave. Avoid overfilling the discs and leave a reasonable space for free virtual memory. Have you tried it. Would that setting work? When you create your own image using DOS you get the the numbers from DOS that I have used for 2GB, and it works as I have full 2GB in use. The codes you are showing probably work too or maybe not without trying them out. It follows the same logic. Thats why I am not sure about what is posted with 1023 as the last digits without trying it? Fantastic! Great Graphics! Working on getting my Windows 98 up and running! !